Egg-Free Applesauce Cupcakes were inspired by a vintage cookbook called The Cake Book which I bought last year at Bonnie Slotnick’s store in New York. The recipe caught my eye because it was egg-free and I was out of eggs. Eggs or not, the cupcakes were terrific! The original version was not frosted, but life’s too short to leave cupcakes unfrosted, so I experimented with two different ones. For one batch I used sweetened whipped cream and a little Smucker’s butterscotch topping I had in the refrigerator. 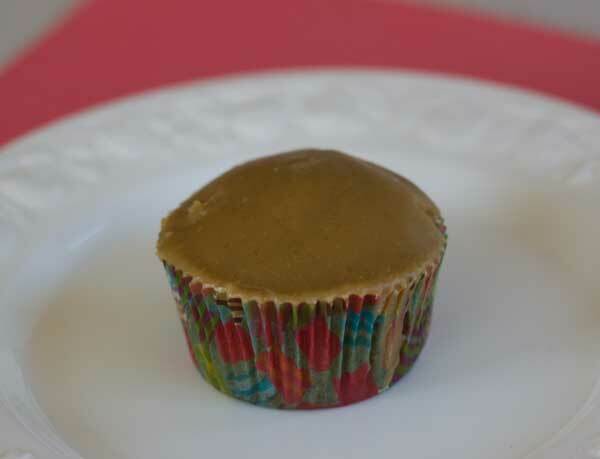 And for the other I used The Cake Mix Doctor’s Quick Caramel Icing. They were both really good. The caramel icing tasted the best, but I liked the look of the ones topped with whipped cream. Maybe next time I’ll use both! Preheat oven to 375 degrees F. Line 16 to 18 cupcake cups with paper or foil liners. Mix the flour, cloves, nutmeg and cinnamon together in a bowl and set aside. In a large mixing bowl using an electric mixer, beat the butter and sugar until smooth and creamy. Beat in the vanilla. Dissolve the baking soda in the applesauce and add to the butter mixture. Gradually add the flour mixture and the buttermilk, beating with a mixing spoon (I don’t recommend using an electric mixer for this part, as it may toughen up the gluten in the flour) until well-blended. To make the caramel icing, combine the butter and both sugars in a heavy saucepan and heat over medium, stirring often, until mixture begins to boil (this should take about 2 minutes). Remove from heat and stir in the milk. Return to heat and cook until mixture begins to boil again. Remove from heat and add the powdered sugar and vanilla. Stir vigorously with a wooden spoon until smooth, then spoon over the cupcakes. Icing sets quickly, so make sure to spoon it on while warm. If it starts to solidify in the pan, put it over a medium low heat. 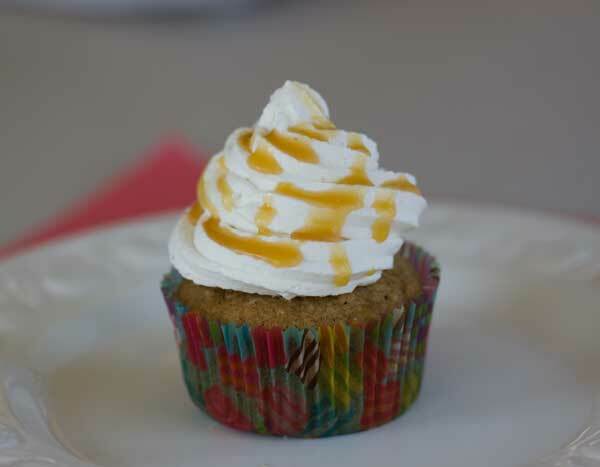 Alternatively, you can just frost the cupcakes with lightly sweetened whipped cream. If you use unsalted butter, add about 3/8 teaspoon of salt to the batter. To make sweetened whipped cream, beat 2 cups of heavy cream until slightly thickened, then gradually add 1/4 to 1/3 cup powdered sugar and beat until stiff peaks form. Beat in vanilla. Pipe or spoon on cupcakes. I garnished mine with caramel syrup. This is an old recipe adapted from a cake book. The original version was baked at 425 F, but 375 worked perfectly. Also, the original version was topped with just a bit of brown sugar and cinnamon. It also included nuts and raisins. That caramel icing looks sinful! Seems like a good Fall recipe. I’ll bet you could use canned pumpkin in place of apple sauce? Wow, I just found a partial jar of my homemade applebutter in the refrig. Hmmm, I wonder what would happen if I substituted that for the applesauce and cut down on some of the spices?? I might just go into experimental mode today. We have had freezing ice fog for 2 days in a row. Visibilities often less than a quarter mile and it is lasting all day. Dreary! Baking cheers things up. We’re snowed in today in KC (2nd time in a week) so I’m looking for something to bake. The nice thing about this recipe is the ingredients are ones usually on hand. It’s simple to make a cup of applesauce in the microwave if you have apples. I never buy dark brown sugar, but I bet using all light brown would work okay. And my favorite “secret” is fat-free evaporated milk which I sub for cream or buttermilk. This may not be what I bake today, but I’m saving it. Thanks!